All the titans. . HD Wallpaper and background images in the टीन टाइटन्स club tagged: teen titans. This टीन टाइटन्स photo might contain मोबाइल फोनों के लिए, हास्य पुस्तक, मंगा, कार्टून, एनीमे, कॉमिक बुक, and manga. Kid flash and Wonder girl!? Where there actually episodes with them in them? I haven't seen those! Kid flash was in the episode "Light speed" and Wonder girl was in the comics. 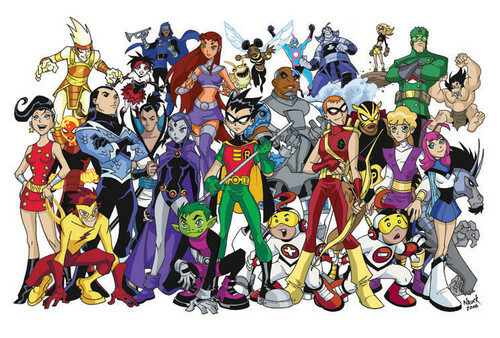 This picture was one of the initial sketches made by one of the Teen Titans creators. It's possible that at the time those characters did not exist or the artist chose not to include them. Young justice sprouted off of teen titains? !